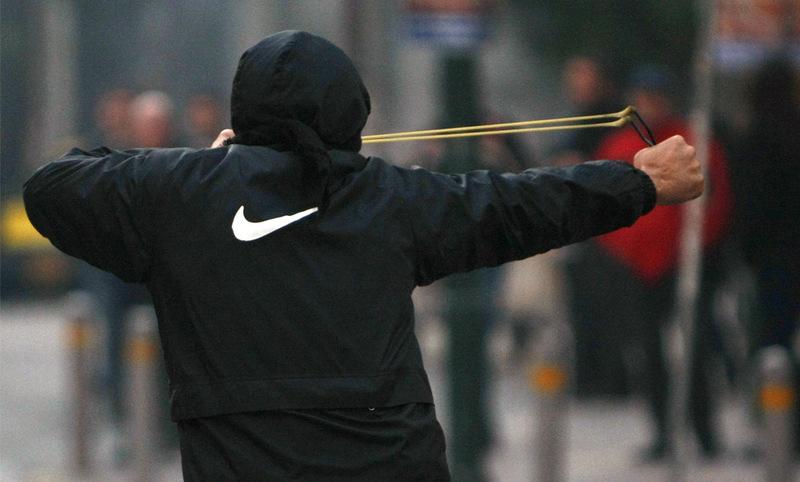 Full Greek Riots Gallery here. Yes, some men come to ogle the candidate, too. “She’s beautiful,” said a man wearing a John Deere T-shirt in Weirs Beach. “I came here to look at her,” he said, and his admiration for Ms. Palin’s appearance became more and more animated. Sheepish over his ogling, he declined to give his real name (“Just call me ‘John Deere’ ”). Earlier Murketing post on consumption and political identity here. Consumed on what Palin rocks — Kazuo Kawasaki 704s — here. Would you feel better or worse if it was Red Bull? Diet Red Bull? Starbucks lattes? The Wall Street Journal today has a review of a novel called Dear American Airlines, written by Jonathan Miles. The novel takes the form of an “angry” 180-page letter, composed by “a 53-year-old failed poet and former alcoholic,” stranded at O’Hare because of a flight cancellation that could make him miss his daughter’s wedding. So I’m sure American can’t be too excited about this, and I wonder: Do you have to get permission to use a real company’s name in the title of a novel? Or at least that’s what I assume is going on here. 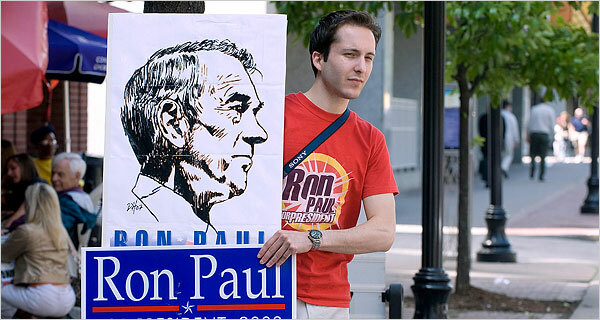 From an NYT story over the weekend about Ron Paul fans. So, as clever readers may have figured out already, I’m not really around the Murketing HQ this week, I’m “on the road,” as they say. Today, in my hotel room, I’m watching the endless loop of Obama and Clinton clips, with the sound down, and I get interested in this one Obama clip, because this one kid behind him is wearing a T-shirt that catches my eye, and as I look harder I realize that there are three frat-looking white dudes behind him all wearing Abercrombie & Fitch T-shirts. I think: Weird. When I finally get a minute to Google, I see that of course it’s been noticed by the trad press (online), and the blognoscenti. We just spoke with Tom Lennox, an A&F spokesman. “I guarantee and assure you it’s not” a product placement, he said. The company was as surprised as anyone to see the three guys, Lennox added. This is a good example of what I hate and love and hate about the Web. On the one hand, I am annoyed that my observation is already played out. On the other hand, I am pleased that others have noticed this and are on the case. On the third hand, this is just kind of triviality that the Web is best at, but I can’t really condemn anyone else for being obsessed with triviality, because I was too. So there you have it. All I need now is a comment telling me I’m really late on this. Anybody? Every company wants its name and logo to be recognized by U.S. consumers. You know, brand equity and all that. Still, most firms could probably do without their employees (or customers) getting popped while wearing clothing bearing its name. As was the case with the 18 recent arrestees pictured in the mug shots on the following pages. Pretty good. But remember: Innocent till proven guilty.